周末读了两篇论文"On Designing and Deploying Internet-Scale Services"和Joe Armstrong的论文"面对软件错误构建可靠的分布式系统",这两篇论文实战内容相当多,整理笔记于此,备忘. An architecture is the set of signiﬁcant decisions about the organization of a sodware system, the selection of the structural elements and their interfaces by which the system is composed, together with their behaviour as speciﬁed in the collaborations among those elements, the composition of these structural and behavioural elements into progressively larger subsystems, and the architectural style that guides this organization—these elements and their interfaces, their collaborations, and their composition. 4．预先定义好的部件——以“从一组预先定义好的部件中选择”的方式进行设计远比“从头设计”的方式要来得容易.Erlang 的OTP库包含了一个完整的现成部件集(称之 behaviour 库),一些常用的系统都可以使用这些部件构建起来.例如 gen_server 这种 behaviour 就可以用来构建client-server 系统,gen_event 这种 behaviour 可以用来构建基于事件(event-based)的程序. 这其中最本质的问题就是故障隔离,操作系统通过进程的概念实现了故障隔离,进程提供了保护区域,一个进程出错,不会影响到其他进程的运行.不同程序员编写的不同应用程序分别跑在不同的进程中; 一个应用程序的错误不会对系统中运行的其他应用程序产生副作用.这种选择当然满足了初步的要求.然而因为所有进程使用同一片 CPU,同一块物理内存,所以当不同进程争抢 CPU 资源或者使用大量内存的时候,还是可能对系统中的其他进程产生负面影响. 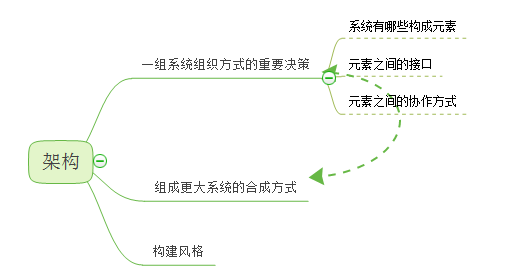 进程间的相互冲突程度取决于操作系统的设计特性. 从某种意义上讲，操作系统提供了“被编程语言设计者遗忘了的东西”.但是在 Erlang 这样的编程语言中, 操作系统是几乎不需要的.OS真正提供给 Erlang的只是一些设备驱动程序,而 OS提供的诸如进程,消息传递,调度,内存管理等等机制都不需要. • Everything is a process. • Processes are strongly isolated. • Process creation and destruction is a lightweight operation. • Message passing is the only way for processes to interact. • Processes have unique names. • If you know the name of a process you can send it a message. • Processes share no resources. • Error handling is non-local. • Processes do what they are supposed to do or fail.